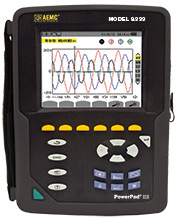 The 8333 PowerPad III is a high quality portable three phase power quality analyzer. Some of the main features of the 8333 are listed below: (for a more comprehensive list please see the datasheet or contact us). Wave forms displayed in color. Measures AC and DC Volts, Amps and Power. Displays in real time and records harmonics to the 50th including direction. Measurement of energy VAh, VARh & Wh. Calculation of the K-Factor for transformers.